Guests of this exciting nighttime adventure can experience up-close encounters with Florida alligators, crocodiles and other aquatic creatures while armed with nothing but a flashlight and some alligator food. Gatorland Night Shine Tour is an after-hours special event ideal for all ages that lasts about an hour and a half and is restricted to Gatorland’s Breeding Marsh. Visit Gatorland's Alligator Breeding Marsh at night and experience up-close encounters with gators. The one-of-a-kind tour lasts about 1 to 1 1/2 hours. Tour begins at dusk, please meet at the far south end of the parking lot. Hot dogs for feeding gators provided. 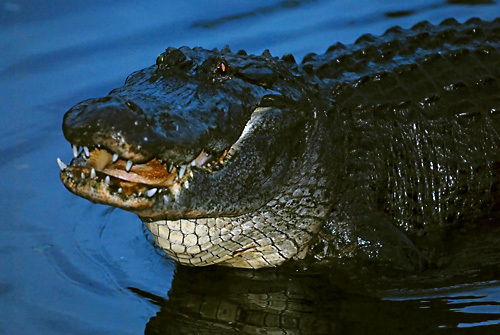 Your Gator Night Shine adventure takes you deep into the domain of Florida's most famous reptile, the alligator! Armed with only a flashlight and a few hot dogs, you bravely make your way along the winding wooden walkways of Gatorland's Alligator Breeding Marsh. The sounds of the night come alive around you as the rustle of feathers overhead and the splashing of water nearby signal that you are not alone. Turning your flashlight towards the water, you suddenly become aware of hundreds of hungry, glowing, red eyes slowly making their way closer… it's now your turn to experience the "Real Florida." A fun and educational tour for kids of all ages, Gatorland's Gator Night Shine Tour is one swamp stompin' adventure you don't want to miss! All tour participants receive a guided tour by our gator experts, hot dogs for feeding the alligators, insect repellent and a flashlight to illuminate the path. How long is the tour experience? The entire tour is approximately 1 - 1.5 hours long depending on group size. Can I purchase same-day tickets? Gatorland Night Shine Tour tickets must be purchased at least 24 hours in advance. All guests should meet their tour guide at the south end of the Gatorland parking lot.